Because who doesn't love the an easy grab-n-go dessert you can pass off as breakfast?! 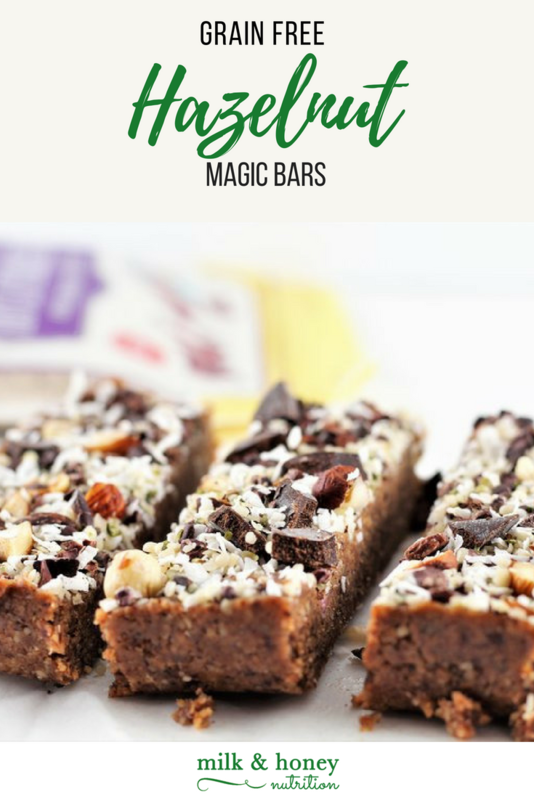 These Grain Free Hazelnut Magic Bars require zero baking, and are the easiest things to mix up. Naturally gluten free, dairy free, vegan, and paleo-friendly, everyone in your family will love them! In a medium size mixing bowl, combine the hazelnut flour, coconut sugar, cinnamon, and sea salt. Stir to combine. Add in the nut butter and maple syrup. Mix the dough together using a rubber spatula. It will be crumbly and slightly dry looking. Press the dough down into a parchment paper lined loaf pan. Mix the toppings together in a small bowl. Pour them over the top of the dough in the loaf pan and press down. Place the pan in the freezer for 2 hours. Slice into bars and enjoy! Store in the freezer or refrigerator in an airtight container!